Steam coils are used in both industrial and HVAC applications and are used to heat air when steam is available. Finned tubes are almost always used in steam coil applications and this type of coil makes use of the latent heat that is released by the steam when it condenses so it is a very effective way of heating air. Beehive steam coils are manufactured from either heavy wall copper or Cu/Ni tubing and can be produced as one of a variety of different styles using ½“ or 5/8“ OD tubing throughout the block and designed to limit condensate retention whithin the coil to reduce the risk of water hammer and also deliver steam evenly to the entire face of the coil. Our heavy duty steam coils can also be supplied using copper, aluminium, or vinyl coated fins plus we can be finished with electro-tin or Blygold coatings for extra protection in the field. We can produce from small to very large units with either same end or opposite end connections at no additional cost. In addition to standard fin/tube block units, Beehive are one of the few manufacturers in the world who can still produce gilled tube coils for certain steam applications in house. If you are after a gilled tube steam coil - then do not hesitate to contact us! 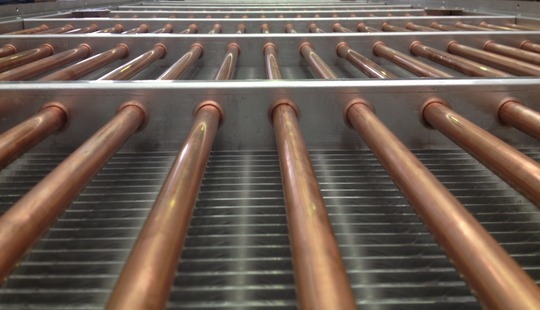 Our steam coils should be treated in the same way as our Evaporators and Condensers in regard to cleaning regularly - but as with any steam or water coil, they can freeze when exposed to sub-zero temperatures without the proper drainage of the condensate - so this aspect is an essential one to consider at the design stage. *Note: Use of inhibited antifreeze is essential as uninhibited product may cause formicary corrosion within the pipes.